Me and pie crust, we're at a war with one another. How embarrassing is it that, as a food blogger — no, a desserts and baking blogger — I'm absolutely, utterly terrible at making pie crust? It's a fussy, difficult process that I don't really have the hang of OR the patience to perfect. I blame my perpetually hot kitchen and my warm hands. I figured a galette — that is, a free-form pie without the pan — would be easier to handle since it wouldn't have any fancy lattice patterns or special crusts to deal with. Unfortunately, the galette was just as unforgiving. My final product was... well, ugly. Or so I thought when I apologetically instagrammed the galette. But one of my friends then commented: "It's not ugly. It's rustic!" Truth be told, I hadn't planned on making anything as fussy as a pie (a galette technically counts as a pie since it uses the same pastry dough). After a decadent birthday meal (it was my birthday last week — did you miss my birthday cake? It's not to be missed.) at one of my favorite restaurants, Ken's Artisan Pizza, I was hit with a rather nasty bout of food poisoning that knocked me out for the majority of the week. Erlend thinks what did me in was the rather wilty looking arugula that I'd ordered solely so I could guiltlessly say that I'd eaten a portion of veggies that day. But alas — food poisoning! That's what I get for trying to be healthy. Despite spending the majority of last week recovering, I still wasn't feeling great and decided it was probably a good idea to lay low and bake something unfussy and low-key this weekend. Something like cookies, or a one-bowl loaf. But as I wandered around the farmer's market, I couldn't help notice the bright pints of blueberries, blackberries, and raspberries. It was still berry season, after all. How could I resist the beautiful Oregon berries, looking like tiny jewels in their inviting blue cartons? 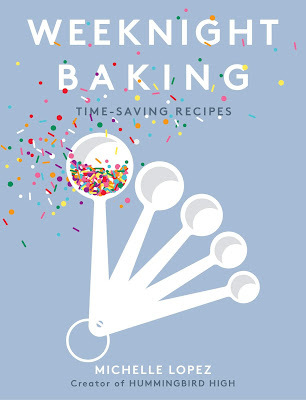 And just like that, there went my notion of baking something simple and fast. Instead, I started conjuring up images of intricate, lattice-covered berry pies. Specifically, Naomi from Bakers Royale's beautiful blackberry and lime pie. But as I stood in my hot, hot, hot kitchen, all ready to go with the ingredients prepped and the oven preheated, I squinted at the recipe's detailed instructions on making the beautiful lattice. And sweat started to run down my face. Not only because it was hot and I still felt a little bit faint from my food poisioning, but because... well... was it really so necessary to put all that work into some dessert I was just going to consume the moment it was going to come out the oven? 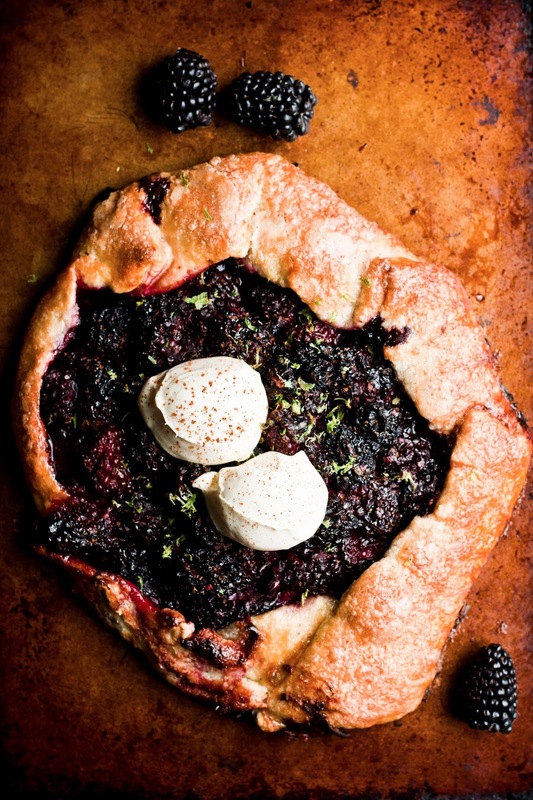 So behold this galette... the same taste, flavor, texture as blackberry pie. Just slightly more forgiving. Slightly. 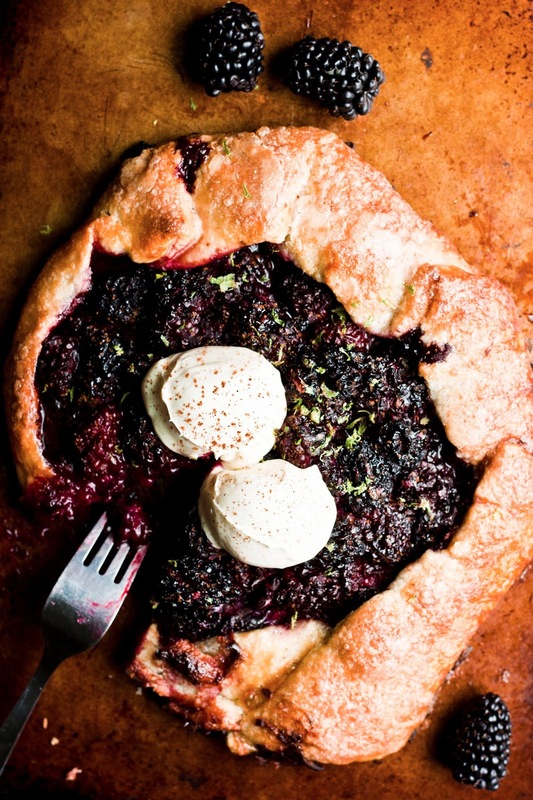 Because with pies, misshapen dough translates into an ugly pie. But with free-form galettes? Misshapen dough becomes character. Story. Authenticity. Rusticity. And in any case, it's just like pie...still absolutely delicious, especially when topped with vanilla ice cream. My kind of pie. I didn't end up using the pie crust recipe that Naomi posted since it contained shortening. As a rule, I don't believe in using shortening in pie crusts — I'm an all-butter pie crust purist. But then again, that might explain why all my pies are always so friggin' ugly. I also didn't end up using her recipe for blackberry and lime filling, since I was worried it would make too much for my galette. Simply, this recipe is inspired by her flavor combination and beautiful work that I didn't have the heart to do. Pay attention to the ingredient temperatures. They're important. Like all pie crusts, this galette is a bit difficult to work with since it contains so much butter. The dough needs to be chilled for at last 30 minutes before you can even work with it. After it's rolled out, it needs to be chilled for another 30 minutes AGAIN. And if at any point you find it too melty and refusing to let go of the surface you rolled it out on, refrigerate it. For the blackberry and lime filling, make sure you adjust the recipe's sugar quantity to match the sweetness of your berries. Feel free to use more sugar if your berries are particularly tart, less if your berries are on the sweet side. Tempting as it is to put the residual berry juice into the galette, DON'T. Adding too much liquid to the center of the galette will cause it to leak and your crust to break (like mine did, a little bit — the broken edge is the result of too much filling/liquid) Don't worry; the berries will leech out juice during the baking process and your galette won't be dry. Don't put anymore liquid in the galette than you have to. 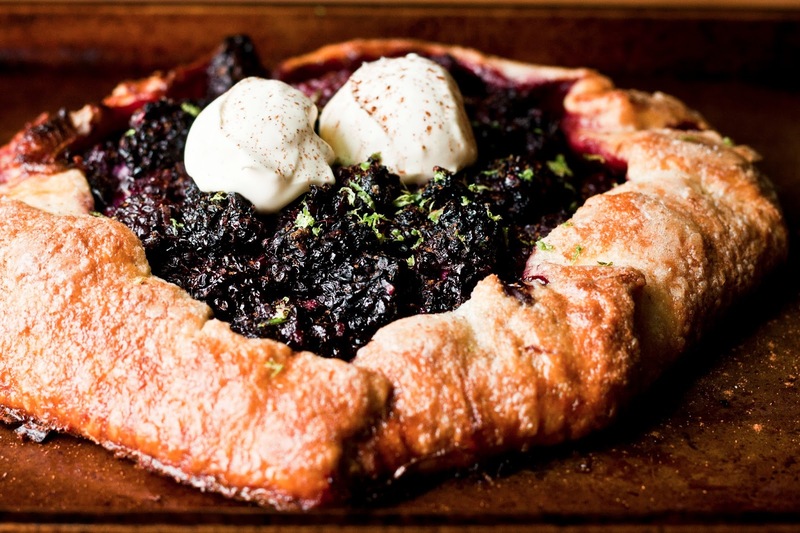 If your galette is tart, top with cinnamon and ice cream or whipped cream. If you used super sweet berries and too much sugar, no worries! Top it with creme fraiche. In a large, wide mixing bowl, combine 1 cup all-purpose flour, 1/2 teaspoon granulated sugar, 1/8 teaspoon salt, and 6 tablespoons cubed, cold unsalted butter. Use a pastry blender or two knives to cut the butter into the flour mixture, continuing to do so until the dough resembles coarse cornmeal and the butter is completely integrated into the flour, reduced to pea-sized pieces or smaller. Dribble four tablespoons very cold water over the mixture, eventually using a rubber spatula to pull the mixture together. Gather the dough into a mound and gently knead together, just for a few seconds. If it's not coming together, add more ice water, a tablespoon at a time until it does. Flatten the dough to a flat disc, wrap in plastic, and refrigerate for at least 30 minutes before rolling out. When the dough is chilled, roll out into a 14-inch circle about 1/8-inch thick on a lightly-floured surface. Transfer the dough to a parchment-lined baking sheet and chill for at least another 30 minutes before using. Make the blackberry and lime filling while the dough is chilling. In a small bowl, combine 1/4 cup granulated sugar and zest from 1 lime. Use your fingers to rub the zest into the sugar — this will help release oils from the zest and make your sugar more flavorful. In a medium bowl, combine 1 pint fresh blackberries, juice from 2 limes, and the sugar and zest mixture (from the first step). Use a rubber spatula to gently toss all the ingredients together until combined. Center your oven rack and preheat the oven to 400 (F). Remove the prerolled dough on the baking sheet from the refrigerator and use a slotted spoon to transfer the blackberry and lime filling to the center of the dough, making sure to leave a 2-inch border uncoated. Be careful not to bring too much liquid to the dough, or your galette will leak through the crust! 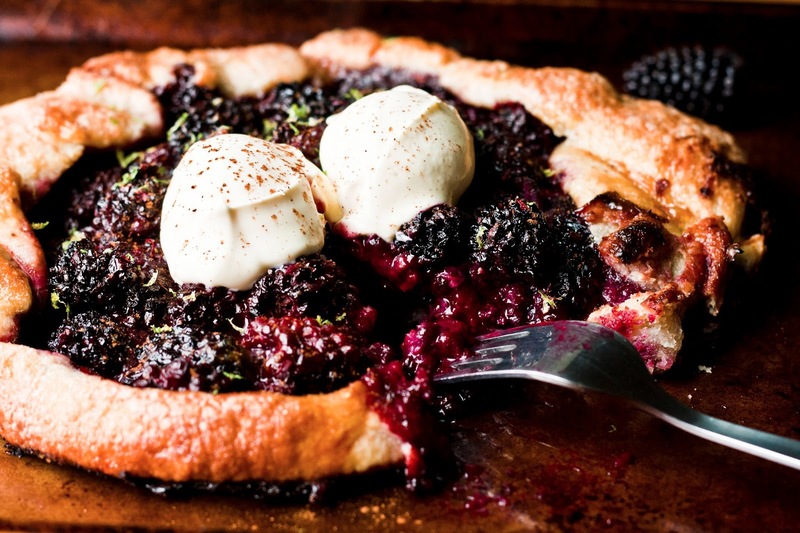 Once you've transferred the blackberry and lime filling, fold the bare border of dough up and over itself at regular intervals, crimping and pushing it up against the fruit. 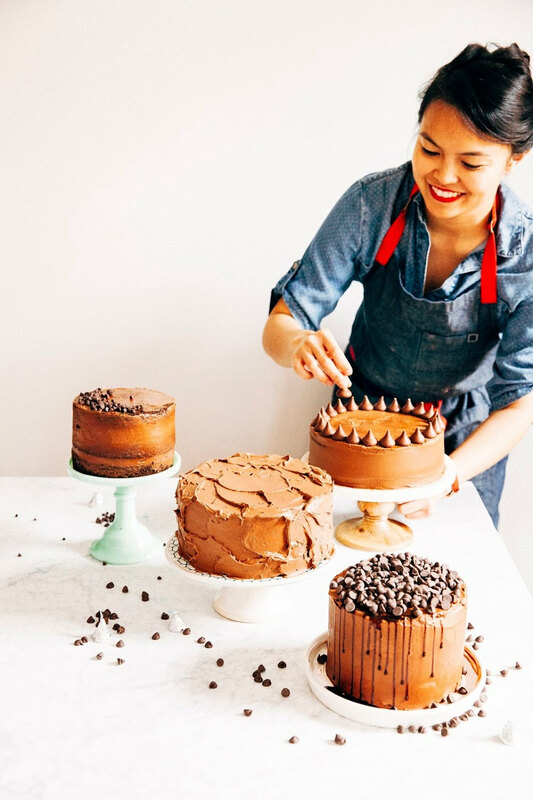 You can use the flat edge of a butter knife to help you — Izy from Top with Cinnamon has a great video of this process. Make sure the folds are tight, so no juice will leak out. In a small bowl, whisk 1 egg. Use a pastry brush to brush over the folded galette crust. In a small bowl, combine 1/4 cup granulated sugar and zest from 1 lime. Use your fingers to rub the zest into the sugar, before sprinkling the mixture over the galette to cover completely. Transfer the galette to the preheated oven and bake for 45 to 50 minutes, until the crust is well browned and its edges are slightly caramelized. As soon as the galette is out of the oven, use a large metal spatula to slide it onto a cooling rack to keep it from getting soggy. Let cool for 20 minutes, before topping with cream/ice cream/creme fraiche and serving while still warm. So weird, the husband and I also suffered from food poisoning last week and from salad! Anyway, when I clicked on the link to your post, the first reaction I had to the picture of your galette, was "wow!"... I think it's gorgeous! And, as for your birthday cake... I saw it and it's fenomenal. Belated happy birthday wishes! I use Alton Brown's recipe, which calls for mostly butter and a little shortening. It has great results! But if you don't want to use shortening, how about lard? these pictures are drool worthy! and i agree with your friend, rustic! This looks amazing. And, I am also an ALL butter fan for pie crusts. I chill and dice one stick of butter. But, my other stick of butter I freeze and grate it into the mixture. Works like a charm! Rustic is the look I go for with anything involving pastry and they've never suffered from it! 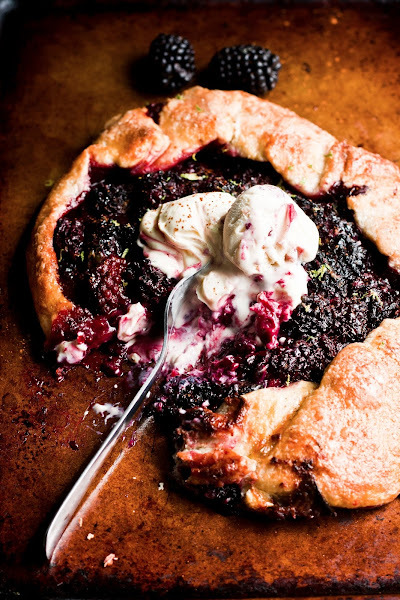 The blackberry/lime combo in the filling sounds really stellar too. Sometimes rustic is even better than perfect :) You did an awesome job with this post! Thank you so much for sharing! I will be making this on the weekend. I have black raspberries. Thoughts on these with the lime? PS:Your not-quite-pie looks both lovely & tasty!